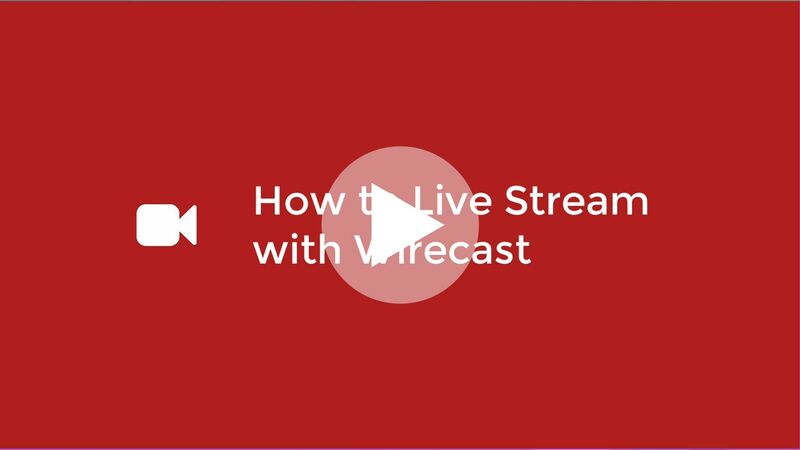 In this article you will learn how to Live Stream to your Live Player using your Wirecast software encoder. If you want to check out some Live Streaming Demos and extra information please visit our Live Streaming information page. Install Wirecast on your computer. Open Wirecast and select Output then Output Settings. In the Output Settings select RTMP Server to setup your RTMP details. Give your RTMP Server settings a name. We recommend naming it the same as your stream quality such as Stream 1080p. Now select the Encoding Drop Down List to choose your desired transmission quality such as H.264 1080p. We now need to enter the Address by copying the RTMP URL from 🎥 Live Studio and pasting it into the Wirecast Address box. With the RTMP Address entered, we will now need to copy the RTMP Stream from 🎥 Live Studio and paste it into the Wirecast Stream box. If you wish to send a Multi Bitrate Live Stream then you simply need to click on the Add button and add one or two more Stream servers. Simply repeat the above steps and select with the same RTMP URL as Address. When creating Stream Server 2 and 3 simply add the number 2 and number 3 at the end of the Stream Key to send the second and third RTMP stream. Click the right arrow button to activate the currently selected source. Start sending the signal from Wirecast by clicking the Stream Button and check that it's being received in the 🎥 Live Studio.